If you are using a modem to browse on your Laptop/ PC and you would like to also share this connection with other devices around you; like a friend's Ipad, mobile device, laptop or any other wifi enabled device. This post will guide you on the simplest way to turn your Laptop/ PC into a wifi hotspot to share your internet with other devices around you. 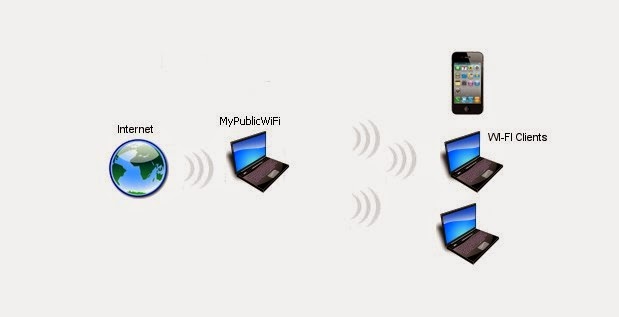 How To Turn Your Laptop into A wifi Hotspot and Share your internet with neighboring devices. 3. Click the first radio button "Automatic Hotspot Configuration"
4. Input the name for your wifi as well as the password to protect you connection from unwanted users. 5. 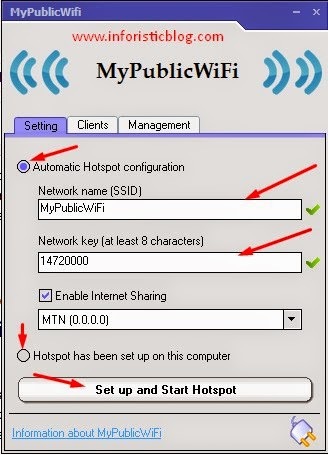 Click on "Enable Internet Sharing" and select the network you are using for your primary network, i choosed MTN since that's my current network as at the time of writing this tutorial. This is very important, else their won't be network access for those neighboring devices to connect to the internet. "Set Up and Start Hotspot"
7. Wait for the setup to complete, it will only take few seconds after which it will change to "Stop Hotspot"
8. Congratulations, you have successfully turned your Laptop to an hotspot to share your internet with other wifi enabled devices. You will now see the wireless network you created available for connection on every wifi-enbled device around there. I hope this was helpful, kindly take few seconds to share this with your friends too through the social buttons towards the end of this post. Comments, questions and observation concerning this tutorial are highly welcomed as well. How can i use the debug url feature? there is this yellow mark on my wireless, please how can i remove it cos its blocking the internet.